Although Gran Turismo 6 game will be released in 2 days, there isn’t much information about it in these latter days, but we, fortunately, have managed to find something interesting about this upcoming racing simulator. Thus, the project’s publisher - Sony - presented short but quite peculiar Gran Turismo 6 trailer that is called “Become at one with your engine”. This video, namely the lesson one in the masterclass, shows us a young man who sits somewhere in a building and, judging by the sounds that he makes, imagine himself driving a car during some race. We should tell you that the engine’s sound from the mouth of this man looks like the real one, because it even allows to discern whether our racer goes on an imaginary straight track or whether he makes a sharp turn or even an overtaking. It looks very funny. But in order you be able to verify it, we offer to watch this short Gran Turismo 6 trailer, published below. We would also like to show another one video for real GT6 fans. It was made by Eurogamer, who managed to penetrate (with the permission of the project's developer, of course) in the menu of Gran Turismo 6. So watch and make a mental note of what and where you will be looking for in this labyrinthine menus. 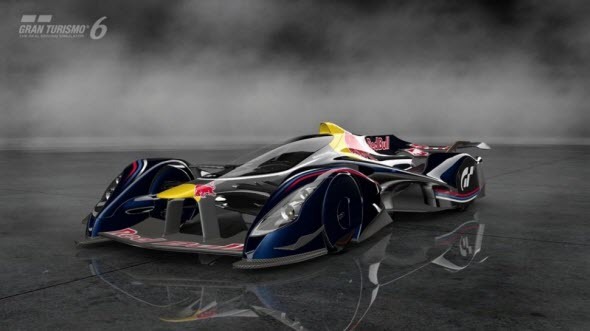 And the last thing we would like to share with you today is the image of an exclusive car, which was designed by Polyphony Digital and Red Bull Racing companies. This supercar will appear only in Gran Turismo 6 game and nowhere else. Enjoy! GT6 game will be launched on the 6th of December for PS3.